This week, one lunch time, I took a moment to sit in Queen Victoria Park. Just sit still and watch people milling about, eating their lunch, enjoying the not-yet-too-hot Brisbane sun. What struck me was the diversity around me. A cacophony of accents from people with features originating from all the continents in the world. Of course, the vast majority of people here are still of British or continental European origin, but our local strength in this globalised world is surely our diversity. When I was a child in monocultural and provincial Denmark, I thought the Korean girl in my grade was beautiful and exotic. Her beautiful black hair, dark brown eyes and golden skin was different. She was one of the first children adopted into Denmark through the international adoption program. This ‘difference’ was unusual where I grew up in the early 1970s. Yet, she was just like any of the girls in my grade – we rode our bikes to school, sang in the choir together and went on camp with the local scout group together. When in the late 1970s Danish Photographer Jacob Holdt visited our small town with his Amerikanske Billeder – a collection of photographs documenting life of African Americans in the early 1970s – my parents took me along to his talk. It had a huge impact on me to see how people – families with children – lived in contemporary America: the squalor and poverty, right there in the wealthiest country on earth. The African Americans too were different, yet they were not embraced by the privileged mainstream society. At about the same time, the television series of Alex Hayley’s Roots came on Danish television. The family saga begins with a young African man brutally captured, trafficked on a sailing ship to America and sold as a slave. As if he was not human. It offended my sense of identity when I learnt that Danish sailors and ships were engaged in this human trade. Safe and healthy in middle class provincial Denmark, my parents taught me that my comfortable life of opportunity was not a given for everyone. It was my luck that I was born to free parents in a place with democracy, social mobility and a strong sense of social justice and equality. Looking back, I can also see that it was easy to be tolerant of difference when you rarely meet it in monocultural Denmark. 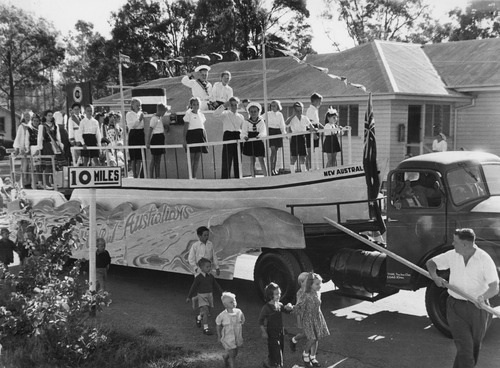 Once upon a time, everyone arrived by boat: Migrant children on a ‘New Australians’ parade float at the Enoggera Immigration Holding Centre, Brisbane, Queensland, ca. 1955. Photo: State Library of Queensland. It is at the edges of cultures that innovation and new thinking happens. When we are all the same and all think the same, it can be hard to generate new ideas and to imagine things could be any other way. At the edge of our ‘we group’, we are challenged by difference and, if we let it happen, new perspectives come together to see our issues and problems in a new light. This diversity of points of view helps join the dots in new and different ways. Monocultural societies – and ‘we groups’ – tend to protect their way of seeing, thinking and doing. And tend to fear difference. A quarter of all Australians are born overseas. Another 20% have at least one parent born overseas. With more than half of Australians either born overseas or being children of people born overseas, we are still very much a country of migrants. Perhaps it is only Australia’s Aboriginal and Torres Strait Islander population, the people of Australia’s first nations – who make up only 3% of our population – who are not migrants to this country. – my own family of four living in Australia, including my husband born in England. Mine is a rather multicultural family – though I would venture to say this is not the Danish norm. When does one’s identity change from Dane with other ethnic background to just Danish? Four hundred years and ten generations back on my father’s side is a German soldier and Rittmeister from Rodinger – does that make me a Dane with other ethnic background? If not, at what point did that change? Seven generations back, six, four? Or does it take 40,000 years to truly belong to a country? Sitting in multicultural Brisbane that lunch hour, I saw people of many different backgrounds, who call Australia home. Some may have been here for generations and some, like me, be first generation migrants. You cannot really tell just by looking at people. However, at the end of the day, no matter how our government statistics classify us, we are all humans with fundamental human needs – including the need to belong and find our place in the sun. We are going to have to figure out how we live with diversity for it will not go away. Thankfully. It makes our lives all the more interesting. This entry was posted in Migration and tagged Alex Hayley, Australia, Belonging, Brisbane, Childhood, Denmark, diversity, identity, immigrant, Jacob Holdt, migrant experience, monocultural, multicultural on August 31, 2014 by lonebonekaffekone.